The MPH2002 second generation press for powder metal compaction. Italy-based SACMI plans to exhibit its second generation press for powder metal compaction at ceramics show CERAMITEC 2015, which takes place from 20–23 October in Munich, Germany. The MPH2002 features a hydraulic circuit that can provide lower energy consumption, with reductions in the order of 15–40% depending on production conditions, and potential speed gains of up to 50% without losing energy efficiency. The core of the circuit consists of two closed-loop controlled pressure lines fed by variable-speed drives and fixed-displacement pumps. These are activated automatically according to the needs of the set pressing cycle and ensure that energy consumption is minimised. SACMI reports that over the last three years more than 40 units have been commissioned in 10 different countries. Besides its mechanical and hydraulic systems, SACMI will be showing its new computer-aided programming system with an assisted programming interface (API). This allows operators to set program parameters more easily. This story is reprinted from material from SACMI, with editorial changes made by Materials Today. The views expressed in this article do not necessarily represent those of Elsevier. 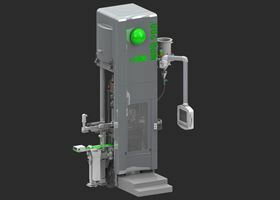 Sacmi USA plans to present its range of pressing and firing equipment at PowderMet, taking place next week in Las Vegas. The organizers of ceramitec 2018 has issued a call for papers for the event.